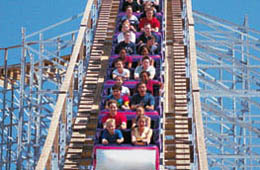 Boomers is a great place to spend a day of fun. There are batting cages, bumber boats & cars, go karts, laser tag, miniature golf, stock karts, a gameroom, and the largest wooden roller coaster in Florida. The facility is available for birthday parties, private, and company events. For more information, fill out the conference inquiry form. • Take Exit 22 toward Stirling Rd. • Turn Left on Bryan Rd. • Turn Left on NW 1st St.
• Boomers is on the Left.